While many people are weighing up the pros and cons of plasma and LCD TVs, the world's biggest consumer electronics companies have already embarked on a new era of display tech that promises to make flatscreens even thinner – and, for a while at least, much more expensive. Meet OLED, organic light-emitting diode technology. Actually, OLED is not that new. First shown in 1999, industry watchers have long been waiting for OLED to graduate from small-screen curiosity to big-screen alternative to LCD and plasma. But technical challenges in super-sizing the technology have meant huge outlays on R&D. OLED's biggest supporters have needed deep pockets and genuine vision to see how the technology might at some point dent LCD TV's massive popularity. There's a lot at stake, but OLED's biggest supporters still believe that it has the potential to become the ultimate home cinema display. Being luminescent, an organic panel lights up when a current passes through – with no need for a power-consuming, bulky backlight. The self-luminance stops when the current flow stops, so OLED screens are also capable of producing perfect black. Unlike plasma or LCD screens, there's no light to filter through and compromise the picture. Add an awesome viewing angle and blur-free images, and it's easy to see why OLED is an exciting proposition. It's taken a while, but production lines for OLED screens, in miniature at least, are maturing. A size of between 2.2in and 2.4in seems to be the current sweet spot, with Samsung and Chinese manufacturer Chi Mei churning out significant numbers of 320 x 240 pixel OLED panels. They should start to filter through to new mobile phones and portable devices at the beginning of next year. Home cinema is a completely different matter, but Sony is leading the charge. Armed with a nascent production line in Japan and a stubborn ambition to be the first to market with new technology, Sony released its debut OLED television in Japan last December. A beautifully designed panel measuring 11in in diameter and weighing in at a paltry two kilograms, Sony's XEL-1 sells for around £875 in Japan. It went on sale in North America in February for the dollar equivalent of approximately £1,300, and is expected to debut in the UK early next year at roughly the same price. 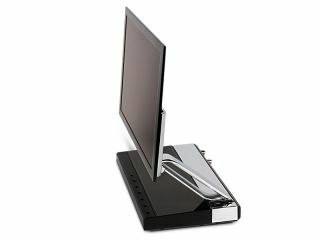 Despite that high price and its diminutive size, the XEL-1 provides a tantalising glimpse into the future of flat TVs. Forget the recent efforts of Hitachi and JVC to get superslim LCD TVs down to 35mm or so, or even Pioneer's promises to produce 9mm plasmas – the XEL-1 measures an unbeatable 3mm in depth. When seen in profile, it virtually disappears. The wafer-thin TV is a reality. To the casual viewer, the Sony XEL-1's picture response is as fast as a CRT, with more depth, and enjoys deeper black levels than usual flatpanels – it actually claims a contrast ratio of over 1,000,000:1. However, it's not even HD Ready, sporting a resolution of just 960 x 540 pixels. "We call this a Quarter HD pixel panel," says Yoshito Shiraishi, Chief engineer for OLED at Sony HQ in Tokyo, as he demos the screen especially for Home Cinema Choice. "It's not an HD panel. Instead it's downscaling it to Quarter HD, but it does seem to be high-def. "And we are going to prepare OLED for high-definition," he continues. "A Full HD 1920 x 1080 panel is not necessary at this size, but if we go larger a Full HD screen will be necessary." 40in or even 50in panels are Sony's ultimate aim, Home Cinema Choice was told. The OLED engineer continues his tour of this futuristic screen, which offers HDMI, USB and Ethernet connections. The latter is there for Japan's HD video-on-demand channel and IPTV services.